Now you can Buy Appy Beacon (the Bluetooth Low Energy Device) that will work seamlessly with your app’s Coupon Feature created using Appy Pie’s App Builder, As soon as the app user comes in the range a push notification will be sent to the user with further instructions to know more or claim an offer. 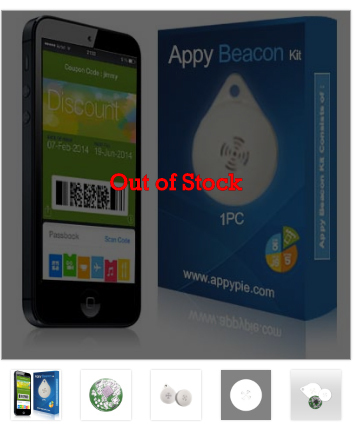 At this Point Appy Beacons just support iPhone & KitKat powered Android devices. The Battery life could vary on the actual use, it could last anywhere between 3 Months to 1 Year depending upon the usage. Free Shipping for all Orders over $75 and for orders less than $75 a flat shipping fees of $10 will be applied. Each Appy Beacon will have a unique UUID for eg. (E2C56DB5-DFFB-48D2-B060-D0F5A71096E0) and it would be using the UUID you will be able to configure your Appy Beacon with your App. Appy Pie’ Appy Beacon will be integrated with your App that you built using Appy Pie’s App Builder and will enable you to send information coupons or even passbook compatible offers. You just have to stick our Appy Beacon sensors in any indoor place, it could be a retail store or shopping complex and your app users will benefit from personalized micro location based notifications and actions when they walk in to your venue or interact with your products. Appy Beacon will help you to guide customer’s right to the location where you want them to go and it will also show them your products that you want them to see. It is all done within seconds when a customer, who has your app installed on his mobile device, iPhone or iPad near your Appy Beacon device. All the information you want to share with them will be sent on their mobile device with directions and prices you are offering. That’s not all, Appy Beacon is a handy tool for travel guides, museum owners, amusement park owners and people associated with other such places as it will update users about particular place and sculptures as soon as they are near the Appy Beacon device. 1. Appy Beacon for a store can help dealers in creating awareness about their products and offers for customers. 2. Appy Beacon for a shopping mall can help customers in locating a particular place of interest which will be way cooler than sign boards and floor maps. 3. Appy Beacon for office building can help employers in managing door access, sending important news and announcements to employees in fraction of seconds. 4. Appy Beacon for museums can help visitors exploring and learning more with constant notification updates. There are endless possibilities with Appy Beacons and to know how it’ll benefit your business. Buy your App Beacon Now.